Mrs. Sanders, my second-grade teacher at University Elementary School in Bloomington, Ind., was one of my all-time favorites. Memories of being in her class have faded, of course, but I still have the creative writing books from that year in school, which now serve as physical and symbolic reminders of what I learned as a 7-year-old. Mrs. Sanders gave specific assignments but I remember how enthusiastic I was about having a notebook dedicated to writing. Before long, I had run out of pages in the first book and had moved on to a second one. Mrs. Sanders gave me an invaluable gift by teaching me to enjoy writing before I had the chance to dislike it once and for all. There’s no doubt that I frequently find it to be a grueling mental exercise, but my belief in my ability to write has rarely, if ever, wavered. There aren’t many other areas in my life that I am similarly confident about. Nor do I consider myself to be a great writer; not having pursued it as a career, I lack the education, frame of reference, repertoire and discipline that professional writers possess. My point is simply that I was encouraged to write, discovered as a second-grader that it could be “fun” and, consequently, saw it as part and parcel of all creative endeavors. The positive associations I have with writing were instilled in me early on by a beloved teacher. Many essays, reports, press releases, research papers, journals, artist statements, contracts, written evaluations, abstracts, recommendation letters—and yes, blog posts—later, I’m thankful that my introduction to writing was a positive one, that it was presented as not only something useful but as a creative and expressive form of communication. Though it can be difficult to categorize, design is also an expressive form of communication. In this day and age, technology provides access to the tools necessary for executing ideas, making the very title “designer” pretty loosely defined. As a result, establishing and demonstrating the true value of design becomes an uphill battle. The democratization of design is generally a positive development, however, elevating the work of creatives as prestigious and deserving of respect becomes simultaneously harder. It has become clearer to me over the years that in thinking critically, working collaboratively, and engaging the creative process, a true designer must be able to talk as well as—you guessed it—write. Perhaps I’m coming to the realization later than some of my cohorts, and perhaps it sounds counterintuitive, but writing is as much a part of being a good designer as the designing part is. And while writing likely doesn’t draw creative individuals to the design profession, the design profession demands that creative individuals know how to write. Too often design is perceived as being separate from the content -- that is, the window-dressing that makes information pretty. But for us, the significance of words and the choices we make when it comes to presenting them cannot be separated out from the meaning derived from them, or from the context they provide. Even if we aren’t the primary authors of whatever written content we happen to be working with, it is incumbent upon us to actually read it and ask questions in order to understand how to visually interpret and convey the information. Writers are still writers and designers are still designers, yet there exists a meeting place between the two. Both professions are attuned to language, after all. 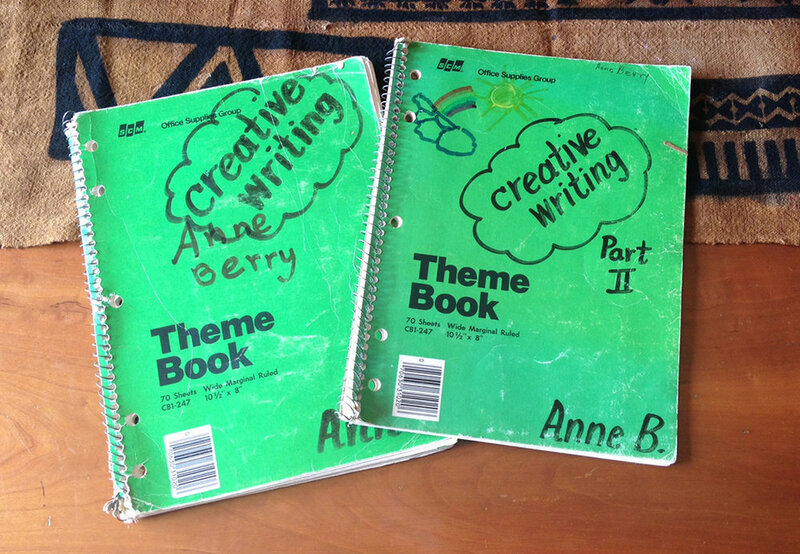 And though the long-term significance of a creative writing notebook was obviously lost on me 30 years ago, I will always be grateful for the interest it sparked in me, and the foundation it set for helping me get through school and smoothing the transition from being a student to a working professional. Thank you, Mrs. Sanders, wherever you are.